So, what is a trademark? A trademark is generally a word, phrase, symbol, or design, or a combination thereof, that identifies and distinguishes the source of the goods of one party from those of others. Many folks confuse trademarks, copyrights, and patents. They are not the same thing – they each protect a different type of intellectual property. A trademark typically protects brand names and logos used on goods and services. A copyright protects an original artistic or literary work. A patent protects an invention. For example, if you invent a new kind of fermentation vessel, you would apply for a patent to protect the invention itself, apply to register a trademark to protect the brand name of the vessel, and possibly register a copyright for the magazine advertisement that you use to market the vessel. Folks also get confused about the difference between the symbols TM, SM, and ®. If you claim rights to use a mark, you may use “TM” (trademark) or “SM” (service mark – same thing as a trademark except used for services rather than goods) to alert the public to your claim of ownership of the mark, regardless of whether you have filed an application with the United States Patent and Trademark Office (USPTO). However, you may use the federal registration symbol “®” only if your mark is actually registered with the USPTO. Because not every mark is registrable with the USPTO nor is every mark legally protectable, it is very important that you carefully choose or create your mark. You will need to consider whether your mark will likely be confused with another mark already registered or with a mark that is unregistered but which you know is in use. For example, this past May, Magic Hat filed a lawsuit against Lexington, Ky-based West Sixth Brewing Company, in the United States District Court in Lexington Kentucky, alleging that trademark infringement concerning designs and trade dress associated with the Magic Hat #9 brand. 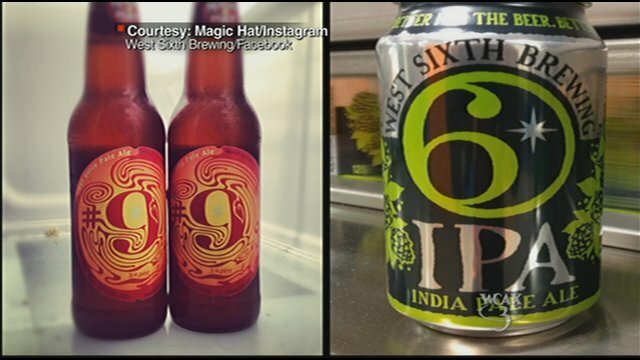 Magic Hat asserted that the logos of the two brands are “confusingly similar.” Fortunately, Magic Hat and West Sixth Brewing were able to find a resolution. Generally speaking, these are the basic trademark categories: (1) fanciful/coined, (2) arbitrary, (3) suggestive, (4) descriptive, and (5) generic. (1) Fanciful/Coined – invented words with no dictionary or other known meaning. For example, BUSTICOLLA for a malt-based beverage. (2) Arbitrary – actual words with a known meaning that have no association with the goodsprotected. For example, PAPERCLIP for a malt-based beverage. (3) Suggestive – words that suggest, but do not describe, qualities or a connection to the goods. For example, WHEAT NECTAR for a malt-based beverage. (4) Descriptive – words or designs that describe the goods. For example, HEADY or a drawing of a beer mug for a malt-based beverage. (5) Generic – words that are common, everyday names for goods. For example, BEER for a malt-based beverage. The strongest categories are fanciful and arbitrary. Suggestive is not as strong as fanciful or arbitrary, but can become stronger through continuous use. Descriptive is considered weak. Generic marks are not protectable. The application process for filing a trademark may be complex. Additionally, it will require you to comply with all requirements of the trademark statute and rules. The upfront cost of hiring an attorney may save you from costly legal problems down the road. Once you have chosen a mark, you must list the specific goods for which you want to register your mark. It is important to accurately describe your goods. For example, it is not a good idea to state that you plan to use your mark with wine, distilled spirits, and beer, if you only actually plan to use it with beer. If the USPTO issues the registration for wine, distilled spirits, and beer, but the mark has not been used in commerce with wine and distilled spirits, the registration can be subject to cancellation based on fraud. Additionally, the application must specify your “basis” for filing. The primary types of bases for filing are “use-in-commerce” and “intent-to-use.” To file under the “use-in-commerce” basis, you must be using the mark in the sale or transport of goods in “interstate” commerce. You may file under the “intent-to-use” basis if you have not yet used the mark in interstate commerce but plan to so in the future. Note: you must have a good faith or bona fide intent to use the mark in commerce. Well, what about companies that wish to register a trademark for products intended only for intrastate sale (within a single state) rather than interstate sale. For example, say a couple of guys want to start a nano-brewery in Americus, Georgia and that they have no intention of selling the product outside of Georgia, can they file for federal registration of their trademark? Generally speaking, the answer is no. However, there are other ways of protecting your mark if you aren’t eligible for federal registration, e.g., filing for registration with your respective state. After your application is filed, it will take approximately three months before the examining attorney will review your application. The entire registration process may take up to a year or more depending on the circumstances. For this reason, it is important to start the process sooner than later. If the examining attorney does not refuse registration or identify additional requirements, he or she will approve the mark for publication in the Official Gazette, a weekly online publication, and the USPTO will send you a Notice of Publication stating the publication date. After publication, there is a 30-day period in which the public may object to the registration of the mark by filing an opposition. Absent any opposition, the USPTO generally will issue a registration certificate about 11 weeks after publication, if the application is based upon “use-in-commerce.” If based upon “intent-to-use,” the USPTO generally will issue a Notice of Allowance (NOA) about 8 weeks after publication. A NOA means that your mark has been allowed, but does not mean that it has been registered. Within 6 months of the issue date of the NOA you must either submit a State of Use or submit a Request for an Extension of Time to File a Statement of Use. To maintain your trademark registration, you must file your first maintenance document between the 5th and 6th year after the registration date and thereafter at the time of renewal. The USPTO does not currently send reminder notices when the documents are due. If the documents are not timely filed, your registration will be cancelled and cannot be revived or reinstated, which means that you will have to start the process all over. Oh, and by the way, the application fee is non-refundable. Measure twice, cut once.